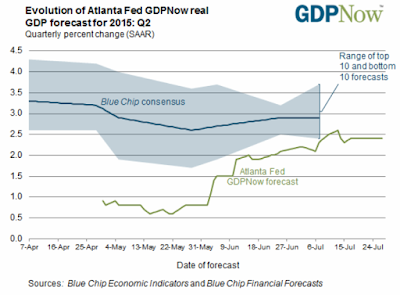 The Atlanta Fed second quarter GDPNow final estimate came in at 2.4%. The second quarter GDP official "advance" estimate from the BEA is due out Thursday, July 30 along with the annual revision of the National Income and Product Accounts (NIPA). The Bloomberg Consensus Estimate for second quarter GDP is 2.9%, a half percentage-point higher than the Atlanta Fed model. I will take the under. First quarter GDP releases by the BEA have been all over the map. The initial reading was +0.2%, revised to -0.7%, then revised again to -0.2%. Whatever number comes out Thursday, expect revisions, possibly in both directions. I expect the final first quarter and/or second quarter GDP to be revised lower.